Preservation Resource, Inc. has been extremely fortunate to have worked as Historic Preservation Design Consultants on the I-4 Improvement Project in the Ybor City National Historic Landmark District in Tampa, FL. The majority of the project was spent rehabilitating homes relocated out of the proposed highway right of way. However, one part of the project allowed us to design and construct a new free-standing structure: a bus shelter. While bus shelters typically do not make designer’s hearts race, this one is one of my favorite projects to have worked on. In part, this is because it is the first completely new, free-standing structure I ever designed that was actually built. We have completed remodeling/ rehabilitation projects of existing historic buildings and have built many additions, but when these types of projects are done well, your work is rarely even noticed because it looks as if it was always there. Starting from the ground up gives a different sense of accomplishment. The shelter was first conceived when we were asked to create a commemorate monument for the long-vacant historic George Washington Jr. High School. The school was located within the proposed highway expansion right of way, and when relocation and leasing options for the building were determined not feasible, the school was demolished. Among multiple options proposed for commemorating the site, the idea of a bus shelter constructed out of materials salvaged from the school was chosen, to be operated by Hillsborough Area Regional Transport (HART). The marker utilizes salvaged brick, one of the original cupolas and reflects design elements from the school building while meeting ADA accessibility requirements. 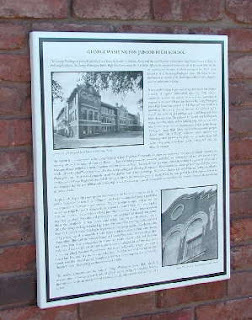 A commemorative plaque was installed on the structure educating passer-bys of the school’s history. In addition, wood flooring, interior doors and other architectural elements were salvaged from the building to be reused at Woodrow Wilson Middle School, a still functioning school with the same original design as the George Washington. Other items were salvaged for use in Public Art Projects by the City of Tampa and HART.